Newer: » Where have all the TV channels gone? Over the weekend of Saturday, June 11th and Sunday, June 12th, the Ambergris Caye Elementary School (ACES) was burglarized. ACES officials observed that the Special Education classroom was the only class that was broken into, and items were stolen from their supply closet. A black Dell 17 inch Inspiron laptop, along with its manufacturer charger, and a black HP Mini 1104 9 inch laptop was taken, totaling over $700 US in losses. ACES contacted the San Pedro Police Department, and three police officers visited scene. At this time, the investigation is still ongoing. Special Educator Sarah Jean Freudenberg is devastated that her classroom was burglarized. “I was very saddened to find that our classroom had been broken into when I arrived to school Monday morning. It looks as though someone broke in through the handicap bathroom window, then broke into the supply closet in the classroom. Other items of value were not removed from the classroom, and no other classrooms were tampered with,” said Freudenberg. The laptops played a significant role in the classroom, and were incorporated into daily lessons. “We cannot enter the class until the investigation is completed, and it has been difficult to explain the situation so that my students can understand. 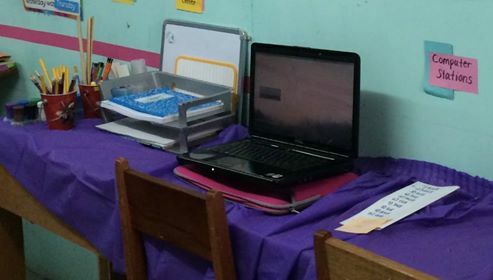 The laptops were used for computer science classes, as well as integrating computers into lessons. Students used the computers to watch academic videos, use interactive academic websites in all subjects (particularly in reading) and additionally were used as a reward for positive behavior,” said Freudenberg. According to Freudenberg, her classroom suffered more than just the loss of the laptops. The major setback it caused for her students with learning disabilities has made it challenging for them to cope with. “Both laptops were donated by community members who believe in our special education program. Not only have the culprits stolen from a school, they have stolen from special needs children. Our children with special needs have become used to their routine here at school and this loss will affect their daily routine. We work very hard to fundraise and collect donations for our special needs program. This is a setback, but we will continue to work hard to provide a quality education for all of our students at ACES, and for our special education students,” said Freudenberg. Merry Christmas from The San Pedro Sun!